TYDO officially announces its BOUNTY campaign! The goal of BOUNTY campaign is advertising of TYDO Pre-ICO & ICO. To know more about TYDO, please follow the project official thread. The total number of tokens reserved for the BOUNTY campaign is 8,000,000 TYD, which is 4% of the target level. Every fulfilled task is honored by points, that are summed in each programme. After the ICO we’ll distribute the tokens among all participants according to programmes and points. All payouts are made in TYD on ETH wallets. Please, do not send your ETH exchange account address, make sure you have an access to the private key of your wallet. • BOUNTY Campaign terms & conditions may be changed if necessary. We will make daily checks on registrations from 1 PC or IP address. All duplicated accounts will be banned and excluded from the BOUNTY Campaign without warning. Bounty Campaign results will be summed up during the first week after the official announcement of the ICO completion. The results of the Bounty Campaign will be summarized in separate spreadsheet. Link will be added later. Thank you very much for being with us, especially to those who help us promote our project. Facebook Campaign is a good opportunity for the participants to earn extra tokens by posting relevant information about TYDO. 15% of Bounty Campaign tokens will be distributed between Facebook Campaign participants. You may join Facebook Bounty Campaign at any moment before the end of an ICO. • Fill in the general registration form for Bounty Campaign. • Fill in the Facebook Campaign participant registration form - CLICK ME FOR THE FORM!! • Link of the Spreadsheet - CLICK ME FOR THE SPREADSHEET!! Twitter Campaign is a good opportunity for the participants to earn extra tokens by posting relevant information about TYDO. 15% of Bounty Campaign tokens will be distributed between Twitter Campaign participants. You may join Twitter Bounty Campaign at any moment before the end of an ICO. • Fill in the Twitter Campaign participant registration form - CLICK ME FOR THE FORM!! • Fill in the Signature Campaign participant registration form: CLICK ME FOR THE FORM!! • Place the following text in your profile: TYDO.io – Pre-Sale Coming in May 2018! • Link for the Spreadsheet - CLICK ME FOR THE SPREADSHEET!! PERSONAL TEXT: TYDO.io – Pre-Sale Coming in May 2018! Presale is Coming in May 2018! 15% of Bounty Campaign tokens will be distributed between Translation & Moderation Campaign participants. To become a participant your application will need to be approved manually by TYDO representative. • Reserve a language you wish to translate to, add some links of your previous translations so we can verify your past experience, and fill the the form here: CLICK ME FOR THE FORM!! • To receive rewards for Translation & Moderation Campaign, you must post the links that you complete all the translation job in the official ANN BOUNTY thread. 5% of Bounty Campaign tokens will be distributed between Telegram Campaign participants. You may join Telegram Bounty Campaign at any moment before the end of an ICO. • Fill in the Telegram Campaign participant registration form: CLICK ME FOR THE LINK!! Blog & Media Campaign is a good opportunity for the participants to earn extra tokens by posting relevant information about TYDO. 20% of Bounty Campaign tokens will be distributed between Blog & Media Campaign participants. You may join Blog & Media Bounty Campaign at any moment before the end of an ICO. • Fill in the Blog & Media Campaign participant registration form - CLICK ME FOR THE FORM!! - Excellent – 50-100 points. TYDO KickICO Voting Campaign allows our supporters to earn TYD tokens for voting for our project on KickICO. Total token pool for this campaign is 2,000,000 TYD. • TYDO KickICO Voting Campaign starts on May 7th and ends on May 18th at 18:00 UTC if TYDO is on the 1st place of KickICO Community Choice ratings (https://www.kickico.com/rating ). - 5,000 TYD if your voice weight on KickICO is more than 2.00. - 3,500 TYD if your voice weight on KickICO is 2.00. - 2,000 TYD if your voice weight on KickICO is 1.00. • If you intend to participate in KickICO Voting Campaign ONLY, there is NO NEED to fill in the general registration form for Bounty Campaign. If you want to participate in any other Bounty Programme, please, do fill it. • Fill in the KickICO Campaign participant registration form - CLICK ME FOR THE FORM!! • Participants must have active KickICO account with ability to vote for campaigns in the Community Choice section - https://www.kickico.com/rating. 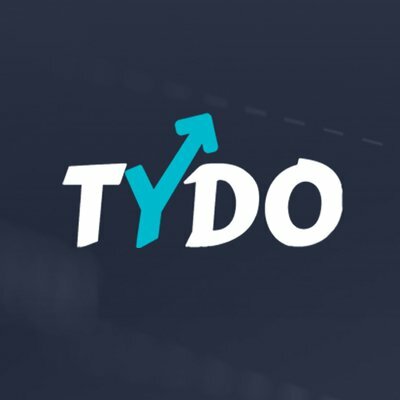 • Join TYDO Telegram group: https://t.me/tydocommunity (this is MANDATORY, if a participant is not in TYDO Telegram group, he/she will be disqualified). • You can vote at any time. • Right after you vote, please, make a screenshot with your TYDO upvote, your vote weight, current time and date. • Send your name and screenshot from your registered e-mail to bounty@tydo.io . • If you leave a positive comment about TYDO on TYDO project page on KickICO you will be rewarded with 1,000 more TYD. You should also provide a screenshot with your comment, and current time and date to bounty@tydo.io . • TYD tokens will be transferred to your specified wallet within 14 days AFTER the Main Sale. If you have any questions about TYDO Bounty Campaign, you can pm @ryjin1007 on Telegram, he is our bounty manager!